Posted in Cingular, Research In Motion | Comments Off on RIM announces EDGE-enabled BlackBerry 8700c based on Intel CPU exclusively on Cingular. Cingular to introduce Sony-Ericsson Z520a soon. 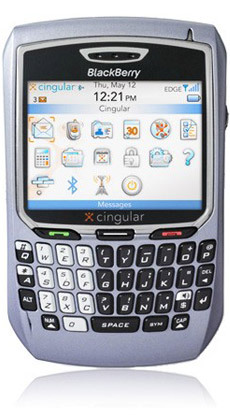 Word on the street is that Cingular will release Z520a in a few weeks to replace the now-aging Z500. The new model is smaller and lighter and adds Bluetooth support. Even more importantly the phone is now quad-band GSM. Posted in Cingular, Sony Ericsson | Comments Off on Cingular to introduce Sony-Ericsson Z520a soon. Freedom Wireless’ pre-paid wireless patent upheld. A federal court upheld previous patent decision and ordered Boston Communications Group (BCGI) and Cingular Wireless to stop selling prepaid wireless services based on Freedom Wireless’ patented systems. The ruling allows BCGI and Cingular to service current customers for 90 days while paying Freedom Wireless 2.5cents/minute royalty. BCGI CEO issued a statement assuring that his company will continue the appeals process. It appears that only Cingular TDMA pre-paid service is affected – and as Cingular has been hard at work transitioning to GSM this decision will probably only accelerate that process. Posted in Carriers, Cingular | Comments Off on Freedom Wireless’ pre-paid wireless patent upheld. You are currently browsing the archives for the Cingular category.